Two boys at a Catholic boarding school in Zimbabwe are among the more than 300 people confirmed dead in the aftermath of a cyclone that slammed into Mozambique, Zimbabwe and Malawi. Source: CNS. Officials fear the death toll from the cyclone could reach 1,000. A landslide sent rocks crashing into a dormitory at St Charles Lwanga Seminary Secondary School in Mutare Diocese, trapping about 50 students and staff. They dug themselves out, and teachers carried the boys’ bodies for about 16 kilometres in the Chimanimani district, a mountainous area in eastern Zimbabwe, before the group was picked up by the army and taken to the nearest hospital. 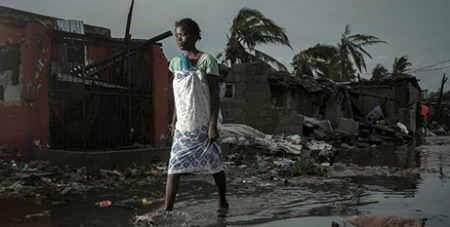 In Mozambique, more than 200 people have died and nearly 350,000 are at risk, President Filipe Nyusi said on Tuesday. In Zimbabwe, the government said about 100 people had died, but the death toll could triple. “It’s very difficult to know the extent of the damage” and the death toll, with collapsed infrastructure and communication lines down, Erica Dahl-Bredine, the United States Catholic Relief Services’ representative for Mozambique, said in a March 18 telephone interview. “People are stranded on roofs of houses and in trees, waiting for help,” Ms Dahl-Bredine said, noting that roads and bridges have been washed away. Cyclone Idai landed in Beira late March 14 before moving to Zimbabwe with strong winds and heavy rain.